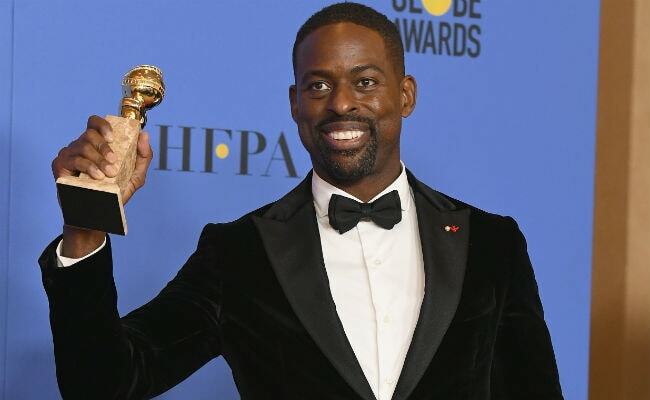 Sterling K Brown received the Golden Globe for best performance in a TV series - Drama for This Is Us on Sunday night. In his acceptance speech, the 41-year-old actor thanked his wife, kids and his team, as well as This Is Us creator Dan Fogelman for "writing a role for a black man." "You wrote a role for a black man, that could only be played by a black man And so, what I appreciate so much about this is that I'm being seen for who I am, and being appreciated for who I am. And it makes it that much more difficult to dismiss me, or dismiss anybody who looks like me. So thank you Dan," he said. Dan Fogelman was seated with the audience. Sterling K Brown made history as he is the first African-American to win Best Actor (TV) - Drama. Listen to Sterling K Brown's speech here. It is Sterling K Brown's first Golden Globe win. He was previously nominated at last year's Globes for The People v. O.J. Simpson: American Crime Story. He played Christopher Darden in the series, for which he won the Primetime Emmy Award for Outstanding Supporting Actor in a Limited Series or Movie. The other contenders for best performance in a TV series, drama included Jason Bateman in Ozark, Freddie Highmore for The Good Doctor, Bob Odenkirk in Better Call Saul and Liev Schreiber for Ray Donovan. The 75th Golden Globes award is currently underway in Beverly Hills California. Seth Meyers is hosting the event this year.